Improves the taste and smell of your drinking water. CHLORINE TASTE AND ODOR Chlorine is a disinfectant that many water suppliers add to drinking water to kill germs such as giardia and e coli. Especially after heavy rainstorms, your water system may add more chlorine to guarantee that these germs are killed. Chlorine can contribute some adverse effects, such as bad taste and odor. Some people who use drinking water containing chlorine well in excess of EPA’s standard could experience irritating effects to their eyes and nose or stomach discomfort. HYDROGEN SULFIDE TASTE AND ODOR Hydrogen Sulfide is a form of sulfur commonly found in drinking water. It is a common nuisance contaminants that does not usually pose a health risk at the concentrations found in domestic water supplies. Hydrogen sulfide gas produces an offensive “rotten egg” or “sulfur water” odor and taste in the water. In some cases, the odor may be noticeable only when the water is initially turned on or when hot water is run. Heat forces the gas into the air which may cause the odor to be especially offensive in a shower. The offensive odor of hydrogen sulfide gas generally makes testing unnecessary. Most people recognize the “rotten egg” or “sulfur” odor and proceed to correct the problem. Hydrogen sulfide is one of a few water contaminants that can be detected at low concentrations by the human senses. A nuisance associated with hydrogen sulfide includes its corrosiveness to metals such as iron, steel, copper and brass. It can tarnish silverware and discolor copper and brass utensils. Hydrogen sulfide also can cause yellow or black stains on kitchen and bathroom fixtures. Coffee, tea and other beverages made with water containing hydrogen sulfide may be discolored and the appearance and taste of cooked foods can be affected. Sediments include dirt, rust, and particles of plant or animal matter that are suspended in water. 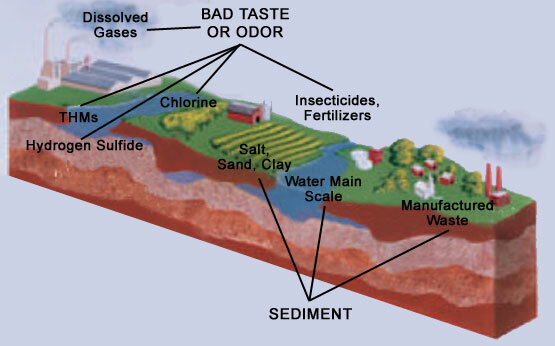 Sediments are the largest water-borne impurity, although most are too small to be seen. Colloidal sediments can be 1/100 of a micron while large particles can be 200 microns or more in size. Sediment problems include cloudy, unappealing water and clogging of water passages in appliances.